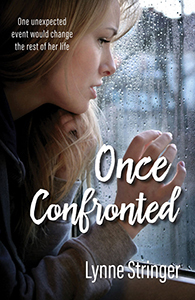 Once Confronted is out now! It was released this weekend and I’ve already held an online launch. The local launch is next weekend. On Saturday 20th April 1991 I was working alone in a bookstore. I had objected to working by myself, as I was worried that something might happen. However, I was told that I would not be allowed to work at night by myself but that nothing would happen in the daytime. However, the store was not on street level and was enclosed by bookshelves, and on Saturdays, it was empty on a regular basis. I wasn’t happy about working alone but what could I do? About eleven-fifteen a man came in. He made as if he was going to buy one of the crosses on chains we had on display at the front counter. He seemed to be trying to decide which one he should buy. He left the store after a little while. He returned about an hour later, and still seemed to be deciding which item he was going to purchase. He even asked for other stores in the area that stocked similar things. The third time he came in, I was the only one in the store. He put a bookmark down on the front counter with a two dollar coin to pay for it. As I started ringing it up, he asked me if he could buy one of the chains we had on a display on the counter that were locked on a turntable. As I reached up to remove one for him, he grabbed my wrist, slammed it down on the counter and put a knife to it, telling me to get the money out of the till for him. I did as I was told and he left quickly, making sure he took with him the two dollars he had put down to pay for the bookmark. I think the whole thing probably took about two minutes but it changed my life forever. It took a while for it to sink in about how much less safe I felt, even in familiar places. While I felt safe in the street where I lived, as we knew most of the neighbours, the moment I turned the corner on my journey to the bus stop to go to work, I was terrified. I took to looking around constantly to see who was there. If there was only one person, I would have to fight not to become hysterical. If there were two people who clearly weren’t together, I felt a little safer. After all, I reasoned, surely both wouldn’t be bad and if one attacked me, the other might help or raise the alarm. So began my habit of counting witnesses. Unlike Maddy, my protagonist, I had always been a cautious person, but it was amazing how even the slightest action on anybody’s behalf now suddenly became dangerous. It made life difficult, especially when I took a new job that was in what was not a good neighbourhood. Getting to and from work became a nightmare while we were there. By 1998, I’d started to recover to some extent, although I still remain nervous in many places and some situations to this day. By 1998, I’d begun writing manuscripts for novels and it was then that the idea of the story for Once Confronted came to me. I wrote the original version fairly quickly, although it took three years before I decided on any title. Originally called How Far Forgive, I shelved it for a long time. Once I became a published author, the story came back to me and I decided to rewrite it. It was a better time to do something like that, as by that time I had a lot more experience in story construction and the ins and outs of writing a novel. It wasn’t long before my publisher agreed to publish it, and after numerous edits and more work, it was finally published, a feat that has been achieved today. It’s been 25 years since I was robbed and it’s amazing how quickly the fear returns whenever I talk about it for any length of time. I guess it will never go away completely. In Once Confronted, Madison Craig knows who her attacker is, and in the end, he’s interested in trying to reconcile with her, saying sorry for what he did. In contrast, I have no idea who my attacker was. He was never convicted or even brought to trial for this crime and I have no idea if he was ever convicted of anything else. So perhaps it’s easy for me to make Maddy forgive him when it’s unlikely I will ever be put in that situation myself. However, I would like to think I’d have the maturity and compassion to do what she chooses to do, although I’m sure it wouldn’t be easy. I guess you could say that this book is like a challenge to myself, to remember that this is something that worked for Maddy, and I have seen people who have chosen not to forgive the people who wronged them and I saw the effect it had on them. It wasn’t pretty and I have no desire to go that route. However, I’m also aware that it’s a process. It takes time and a lot of work to get past the anger and the grief that such an event causes but having seen the alternative route, I don’t think that’s a good way either. In spite of the difficulties, I think forgiveness is a better way to go. You can purchase Once Confronted on Amazon here. Thanks for sharing your experience, Lynne. That must have been very frightening and I can imagine how it affected you after that. One of my relatives was a bank teller and she was present during a couple of bank robberies. It still haunts her, so I’ve seen some of the effects. Good on you for turning it into a positive and using your novel to talk about the issues. Hopefully it will touch others who have been in traumatic situations.